The Paper Dolls presented their world premier of UNHINGED, a psychotic silks duo that explores the relationship between a woman and her demons. Rain Anya returned to the place that started it all- Santa Fe, New Mexico. Where the Paper Doll Militia began as a little seedling, Rain appropriately came to play a dandelion seed dancing in the wind in the 2011 Circus Luminous. This delightful circus production happens every year on Thanksgiving weekend, and has become a holiday staple for the Santa Fe locals for the past 9 years.  Selling out EVERY show this year, Luminous was a smashing success, a collaboration between the downtown historic Lensic Theatre and Wise Fool New Mexico. Rain Anya (Co-Artistic Director of The Paper Doll Militia) and Amy Christian (Artistic Director of Wise Fool, NM) created a side by side aerial silk act entitled “Seeds to Silk.” The two fabric performers intertwined their skills into one captivating performance, weaving elements of floor movement, silhouette, stillness,stunning solo sequences and dynamic synchronized choreography. In the grand re-opening of the National Museum of Scotland 10,000 came to celebrate, all to joyous beatings of drums, the dancing and shenanigans of street performers, and the Paper Doll Militia who could be seen abseiling from the roof clad as a gargoyle. 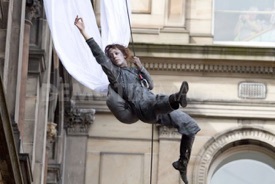 Paper Doll Militia presented their latest full length Aerial Theatre production in Santa Fe, New Mexico, Oakland, CA & San Francisco, CA and finally at the Edinburgh Fringe Festival in Scotland. This modern fairytale for adults fuses aerial acrobatics, original music, animation, and shadow puppetry. With airborne physicality, this dark tale describes a strange encounter between a misfit little girl and an unpredictable and crass incarnation of the Devil. Join us in this magical and violent performance with high octane aerial arts on monkey bars, a streetlamp, and a chain swing. For reviews and more information about This Twisted Tale, please visit the show website. 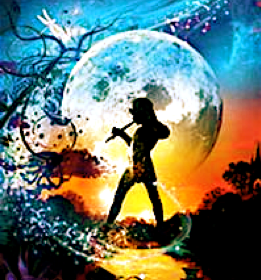 The Paper Dolls recently completed a United States tour with Peter Pan. Direct from London, a spectacular new stage production of J.M. Barrie’s classic story performed in a state-of-the-art 1350-seat theatre pavilion. Rain Anya and Sarah Bebe Holmes are performed on aerial silks as the deadly mermaids of Neverland. Sirenesque and enticing, the mermaids lure Michael and John into the depths. 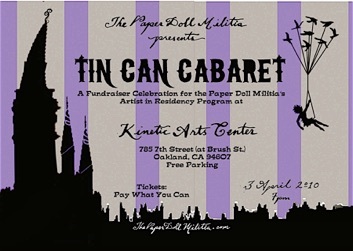 The Tin Can Cabaret is a celebratory evening showcasing Paper Doll Militia’s newest aerial theatre pieces and other contemporary variety and circus acts. In the timeless and forgotten spaces, deep in the cracks of the city streets faeries and floozies, mimes and minstrels have gathered to enchant and delight you. Join us and be transported into a dark and magical Underworld. Prepare to be dazzled by elusive illusionists, astonishing aerialists, profane pantomimes, pirate burlesque acrobats and crazed contortionists.